Some 40 minutes from Muar, Johor, surrounded by oil palm trees, lies the small village of Kampung Parit Hassan Ahmad 2. For many of the villagers, the plantation is their main source of income and managing it is definitely not easy. Harvesting, for example, requires a lot of work, especially if they are using tools that require manual labour such as wheelbarrows. These farmers simply cannot afford to spend their hard-earned money on energy-saving vehicles to transport the harvest. One of the farmers, Wagiman Dulahabedi, decided to come up with a solution. First, he tinkered with a regular wheelbarrow, altering the wheels to make them easier to manoeuvre. But the capacity was limited and it still required a lot of manual labour. Next, he tried cutting an old motorcycle in half and attaching the front end to a steel box. This was slightly better than the wheelbarrow, but the machine did not have a reverse gear, which made it unwieldy and difficult to operate in the rough terrain of the oil palm plantation. “I learnt from mistakes and started working around them to find the best solution. At home, I would try to learn how each component worked and how I could put them together at a fraction of the cost to achieve what the more expensive alternatives can,” says Wagiman. It was through trial and error that he came up with a multipurpose truck that uses a Vespa engine. What makes it especially amazing is that he did not even finish his schooling. With nothing but a measure of common sense and the tenacity to keep trying, he was able to come up with a cost-effective, user-friendly truck that solved an immediate problem for his family. Word of Wagiman’s “invention” spread and soon the other villagers were coming around to see for themselves the practical vehicle he had created at such a low price point. They asked him to sell the truck, so he started scouting around for and collecting scraps (rusty rods and nuts, discarded motorcycles, wooden planks and scrap metal) to build more trucks to help his fellow farmers. “The materials I use are not expensive at all. The tyres, for example, are second-hand and have already lost their grip. I tell people that instead of throwing such things out, why not sell them to me so I can use them for the trucks? These trucks do not need the grip of normal cars as they are not used for fast travel and are only meant to be used on the plantation. What matters most are their durability and low cost,” says Wagiman. Wagiman does not subscribe to the throwaway culture often seen in towns. He believes that every scrap, no matter how rusty or corroded, has value. “I try to make the most of everything that people no longer want, be it tyre rims, gearboxes or plastic chairs. I will add value to these materials,” he says. Kebangsaan Malaysia (UKM) professor who offered him grant funding from a collaboration between UKM’s Centre of Entrepreneurship Development and SMEs and Yayasan Inovasi Malaysia (YIM). “I met the professor when I was exhibiting the trucks. He was interested in what I was doing, so he decided to stop by my workshop one day. He asked me whether I would accept a RM30,000 grant from YIM. I said I would be glad to, but I am a villager and will not have the money to pay it back. So, I asked him to offer it to someone else. To my surprise, he said I did not have to pay it back as it is meant to help me grow my business. He assured me that they were not expecting anything in return. I was so grateful,” says Wagiman. 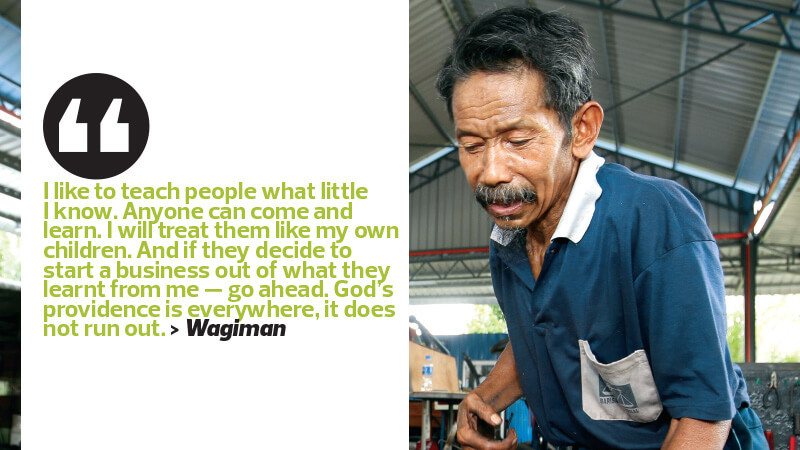 At first, Wagiman did not treat his innovation as his main source of income. It was more of a way to help farmers lessen their burden when working on the plantation. That is why he had not even registered a company to sell the trucks. Once he received the funding, however, the game changed. “The professor asked me to register my company. Personally, I did not feel the need to. I just made the trucks and sold them to anyone who needed them. But the professor said what I was doing had great potential,” says Wagiman. He named the company Wah Gah Enterprise. Gah stands for Gerabak Air Hitam, which his business used to be called before he registered the company. Wah is simply the expression of awe and admiration that he garnered from his customers. With the funding, Wagiman built a proper sheltered workshop and started to buy better, more modern equipment for welding and fabrication. The completed trucks cost between RM5,000 and RM18,000 each — far cheaper than factory-manufactured trucks, which can cost about RM90,000 each. “A basic truck with a big box at the back may cost RM8,000. But if they have more money, they can ask me to make a larger truck with a tippable box for RM13,000. That will save them the hard labour of unloading the harvest. Of course, it does not mean that it can only be used for harvesting,” says Wagiman. 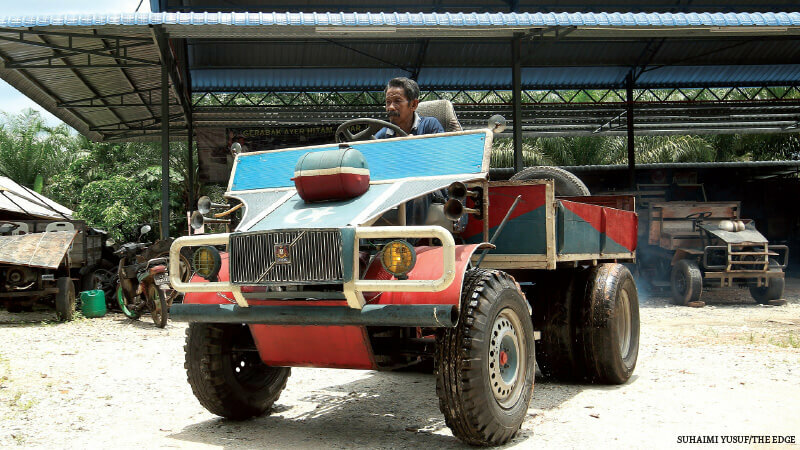 The trucks can be modified and upgraded while tools can be attached and detached according to the requirements of specific activities in the oil palm estates. The key word is flexibility. Wagiman’s multipurpose agricultural truck, for example, can be used for ground clearing work as it comes fully equipped with a steamroller. Other functions include a weeder, insecticide sprayer, jungle log transporter and equipment to chop and splice wood. “They are allowed to customise the trucks — small or large engine, small or large body and brand new or recycled parts. I provide an estimate and if they are okay with the price, I will start building it,” says Wagiman. He is not a sophisticated marketer. But satisfied customers tend to talk, both at warongs and on Facebook. Orders started coming in from far-flung corners such as Bachok in Kelantan, Setiu in Terengganu, Kepala Batas in Penang and Bestari Jaya (formerly known as Batang Berjuntai) in Selangor. But the trucks cannot be driven on highways. So how does he transport them to all these locations? “I used to be a lorry driver before I became a farmer. Since I had already befriended other drivers, it is very easy for me to get people to ship the trucks for me,” says Wagiman. Recently an order came from a plantation company in Sabah. He and his children finished building the truck and had it transported via a cargo ship from Port Klang. Wagiman has certainly come a long way since he built his prototype in 1994. Today, the company has its own blueprint and intellectual property, thanks to YIM’s High Impact Programme 6. In December 2015, the company was registered as Nuruzon Technology Resources Sdn Bhd — named after Wagiman’s son, Nuruzon, who was able to get funding from Unit Peneraju Agenda Bumiputera under its Skim Usahawan Permulaan Bumiputra to commercialise the trucks. Under the commercialisation exercise, things had to be standardised. This meant that the company could no longer throw scraps together as it is looking to export trucks in the future. To maintain the low cost, some of the trucks will still use a combination of recycled and brand-new materials. To date, he and his sons have built and sold 150 trucks. Wagiman is well known in the grassroots community, so much so that he was presented the Grassroot Innovator award by the Ministry of Science, Technology and Innovation in 2012. He was also one of the delegates at the World Innovation Forum Kuala Lumpur in 2013. “Whenever I am invited to events, I always accept and I keep all the souvenirs — the certificates, shirts, notebook and pens. I keep them all carefully. To me, these souvenirs are priceless. They symbolise the people whom I have met and the experiences I got from participating,” says Wagiman. Even as he becomes a well-known figure, he remains a humble villager at heart. There are certain things he will not compromise on. For instance, he makes sure that he treats everyone with equal respect. He believes that this is why so many people have been eager to help him in his journey as an innovator. “I treat everyone the same, be it villagers, big buyers or politicians. When I am at exhibitions, I attend to questions from everyone, no matter what they look like or what they are wearing,” says Wagiman. This is also why he is able to get suppliers willing to offer him the best prices. Quite simply, they just like him. “I treat suppliers like my own siblings even though we are not of the same race. So, they always give me the best bargains,” says Wagiman. The profit margin for each of his trucks is 20% to 25%, but he is willing to reduce prices for those who have thinner wallets. “It is not good to look down on people in hardship. What if they cannot put food on the table? What if they cannot send their children to school? What if they are in debt and are doing their best to rebuild their lives and repay what they owe? These people are in distress and I am more than willing to help,” says Wagiman. He also believes in imparting knowledge to others, especially the youth, although there are not many of them left in his village. His door is always open to underprivileged youth or school dropouts who want to learn the trade. “I like to teach people what little I know. Anyone can come and learn. I will treat them like my own children. If they are good, I am even willing to give them proper salaries. This will certainly make their parents proud. And if they decide to start a business out of what they learnt from me — go ahead. God’s providence is everywhere, it does not run out,” says Wagiman.